Ryan McKinley has tried to move on from his ex-wife, Abby. He’s sulked, he’s gotten angry, and ultimately he bought her dream house. Big mistake. Living alone in the massive two-story has only made him miss her more. When her parents call him out of the blue about their anniversary party in Summer Harbor, Maine, Ryan believes God has dropped a golden opportunity straight in his lap. Abby McKinley never exactly told her parents about the divorce. A strained relationship with her dad has culminated in a distant relationship with her parents, but she’s finally succumbed to her mom’s pressure to make the drive for their 35th-anniversary party. Then Ryan shows up on her doorstep, looking as handsome as ever. When he insists he’s going to Summer Harbor, with or without her, Abby knows she can’t say no. Her parents still think they’re married and now Ryan knows it too. It’s just a one-week road trip with the man who broke her heart. What could possibly go wrong? 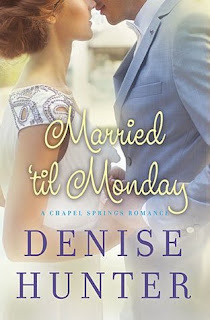 In Married 'til Monday, Denise takes a small departure from your typical romance to give us a story of reconciliation. Still, this story is packed full of pursuit and romance in much the way readers have come to expect from Denise. She writes strong leads, and this book is no exception. What I loved about this book was that the finger of blame didn't point in one direction. This was truly a story of growth for both characters. Moments of humbleness, moments of understanding, and a true picture of forgiveness and love. Healing occurred on so many levels though these characters, and hope was seen in their relationship. No easy answers were reached, which rang true to life. Life is messy, but there is hope in it--especially when we're willing to wade through the muck of our past, dig deep, and allow God to heal us. Even in the midst of all these pages, Denise does a beautiful job of showing true romance. Maybe because true romance and love isn't always pretty. In fact, it's in the messes that love can be seen best. It's easy to love someone when things are going well, but to walk them through some ugly places? To forgive? To keep loving? That's the love that stands strong, and it's also an amazing picture of God's love. Married 'til Monday was a wonderful end to this series. As a returning reader you get to see all the characters you fell in love with over the first books. If you're a new reader to the series, you'll easily jump right in without feeling lost, but you'll want to go back and get to know this family by the time you're done:) It's definitely a series I'll keep on my shelf. Married 'til Monday can be purchased here. Happy reading, friends! The cover is beautiful and would make me turn over to read the blurb even if Denise's name wasn't on it. I love the thought of a story or reconciliation. Thanks for sharing. It sounds like a great story!